For every product sold or service provided, there is a bill of sale issued to the consumer. Businesses want the consumer to remember their favorable shopping experience with them. A professional, attractive invoice will leave the customer with a lasting impression of their visit to your business. The VAT invoice shows the total amount of the purchase and has a separate column showing the VAT included in the purchase price. Our free VAT invoice is easy-to-use and downloadable from this page. It is completely customizable for a polished, professional appearance! Add your store or business logo. Having your corporate logo on the VAT invoice will give it a professional look. Also add the name of the business and full address, including the street name and number, city, country, phone and VAT number, and e-mail address. Review the fields on our VAT invoice. Amend them to include any information that is specific to your business. For example, if your business is a restaurant and the gratuity is included, that should be shown in a separate column. Delete any fields that are not required. Include fields for customer information. These can be as specific as your business requires. Generating paperwork is a requirement of doing business. 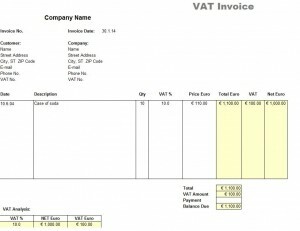 Use our downloadable VAT invoice to create a polished image.